Discover trends and innovations for the factory of the future! 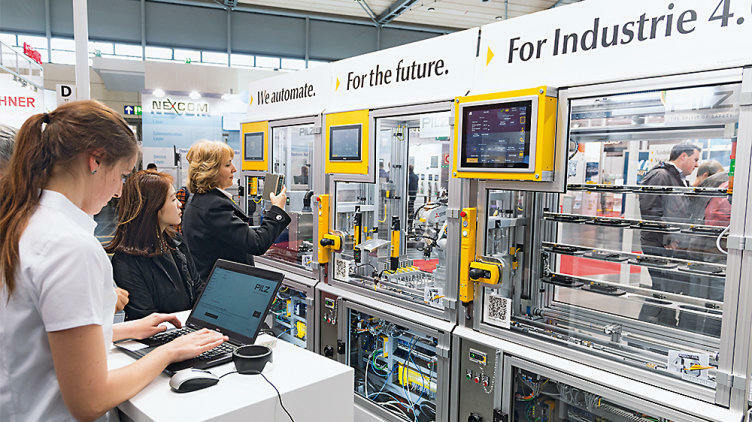 At the Hannover Messe from 23 - 27 April 2018, we will show you how to safely automate your factory. The highlight of our presence at the exhibition will be our new modular and Industrie-4.0-compatible safety gate system. Realise your individual safety gate solution with the modular and Industrie-4.0-compatible safety gate system from Pilz! Flexibly combine the safety gate sensors PSENslock and PSENmlock – now optionally available with escape release or series connection – with additional Pilz components. Also using the Safety Device Diagnostics (SDD) will save you expensive separate wiring in the control cabinet. With the SDD, you can individually actuate your switches and safety gates – completely in the spirit of Industrie 4.0! The solution offer now also includes: the pushbutton unit PITgatebox. Whether an illuminated pushbutton or an E-STOP button – with the PITgatebox you expand your safety gate system to include additional operator and pushbutton elements. New machine operating concepts will be required in the factory of the future. With the global innovation PSENmat we are offering you a pressure-sensitive safety mat with integrated switch functionality. PSENmat thereby combines safe area monitoring according to EN ISO 13856-1 with operation of plant and machinery in one sensor. Through defined, marked mat areas, the operator can take advantage of the integrated switch functionality and work hands-free. PSENmat thereby creates an obstacle-free workspace and reduces the risk of accidents in applications where a clear overview cannot be achieved. PSENmat protects workspaces shared by man and machine, for example, which will be required by the factory of the future. At the Hannover Messe we will be introducing two new modules for the configurable, safe small controllers PNOZmulti 2. For the safe monitoring of mechanical presses, Pilz has added a new dual-pole semiconductor output to the product portfolio. Thanks to the modular programme, press operators can now also benefit from an intelligent and rapid shutdown of the machine in less than 12 milliseconds! The safe analogue input modules for the small controllers PNOZmulti are a world first. Benefit from even clearer diagnostics! For the first time, arithmetic functions such as averaging or differential pressure calculation make it easier to configure the analogue values. We will be presenting these and many other innovations from the fields of sensor, control and drive technology, as well as software and services in Hanover from 23 - 27/04/2018. Curious? Visit us in Hall 9, Stand D17. We look forward to seeing you!